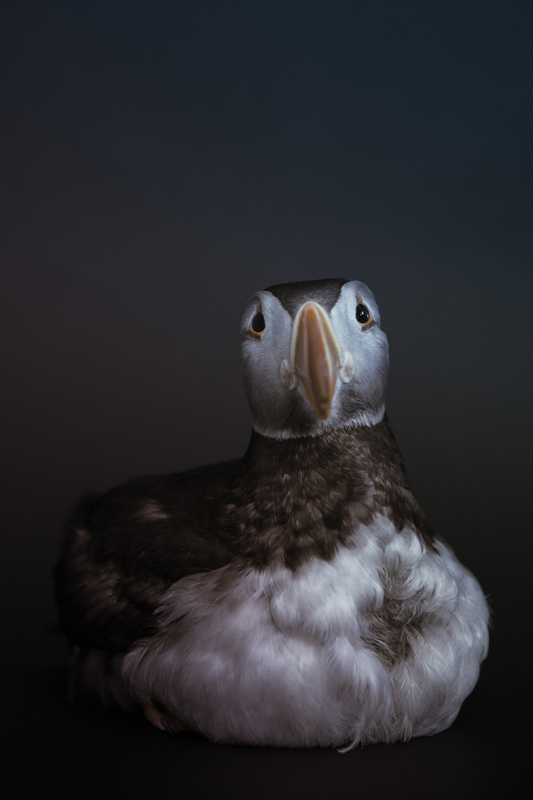 Tóti, a 4-year-old captive Atlantic Puffin, stands for a portrait in the NAME MUSEUM, in Vestmannaeyjar (the Westman Islands), Iceland — a small, volcanic archipelago off the southern coast of Iceland. Tóti was rescued by local residents and came to the aquarium as a puffling after being abandoned in the nest and not mature or strong enough to fly out to see on his own. Some 830,000 nesting pairs of puffins come to the Westman Islands each year to breed on the steep, grassy cliffs. But those numbers are down from over a million, as the Westman Islands are on their 11th consecutive year of complete reproductive failure and biologists are currently investigating whether warming ocean surface temperatures are driving the puffins' food supply to colder waters in the north and rendering the seabirds unable to breed in their historic nesting grounds. This population collapse has led to a number of behavior adjustments, including the reduction of consuming smoked puffin, a traditional Icelandic dish, and abbreviating the puffin hunting season to only three days this year.